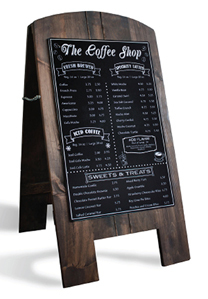 Heavy duty folding wood stand with removable chalk marker board. Removable O-ring accommodates up to 24 inserts held on a black plastic base. Two view clear acrylic tents are top loading.